The Boeing B-52 Stratofortress (Model 464) is a eight-engine heavy strategic bomber aircraft with a maximum weapon-payload of approx. 70,000 lbs (31.750 kg) produced by the US-American manufacturer Boeing Company. 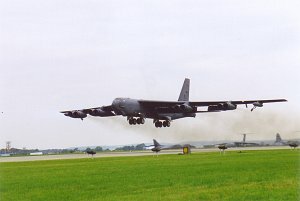 The Boeing B-52 is in service with the United States Air Force since 1955.